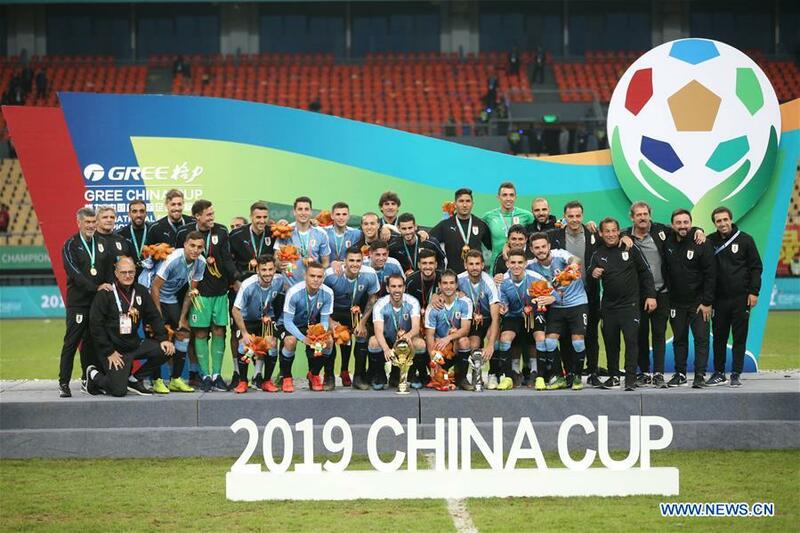 Uruguay retained the China Cup after beating Thailand 4-0 in the final, while a first half goal from Eldor Shomurodov saw Uzbekistan secure a 1-0 win over China PR to finish third on Monday. Thailand had to concede to Uruguay's superiority as the South Americans took the lead just six minutes into the tie with Matias Vecino Falero rising high to head home the ball. Thailand did their best but Uruguay doubled their advantage seven minutes before the break, when a defensive lapse allowed an unmarked Gaston Pereiro to direct Cristhian Stuani's pass from the left flank into the goalmouth. Giorgian De Arrascaeta came off the bench right after the break, and he proved his worth on 58 minutes with a curling corner kick which skipper Stuani slotted home. Thailand found it difficult to breach the Uruguay defence and two minutes from time, Maximiliano Gomez Gonzalez pounced on a loose ball. His shot hit defender Suphan Thongsong and the deflection saw goalkeeper Siwarak Tedsungnoen wrongfooted and the ball settled in the net. China came into the third-place play-off match looking to improve from their 1-0 loss to Thailand in the semi-finals last week, but they were forced to play defensively for long periods in the first half, as Uzbekistan dominated possession and attempts on goal. Uzbekistan played patiently and waited for an opportunity to pounce which came in the 35th minute. The action began with a close-range Uzbekistan pass but the ball deflected off a Chinese defender and flew further into the East Asians' final third, which Shomurodov collected. The 23-year-old then showed his grit and talent when he dribbled past a defender and shot home with a right-footed strike to give Uzbekistan the lead. Fabio Cannavaro's China returned from the break stronger, and began to make inroads but Uzbekistan looked more likely to score with their impressive quick passes in the Chinese box. Uzbekistan, however, failed to convert their chances but in the end, It didn't matter.